Albert Maysles is one of the most iconic documentary filmmakers of all time. Having directed legendary documentaries like Grey Gardens (and its 2006 sequel The Beales of Grey Gardens), Gimme Shelter, and Salesman, Maysles worked as a directing team with his brother, David, until David’s death in 1987. Albert carried on the legacy, and has been actively making documentary films since. Sadly, Albert passed away just a few months ago, but with Iris, Maysles’ last major film, the legendary filmmaker truly goes out on top. Similar to Grey Gardens, Iris is a character study on an eccentric woman who has refused to let age slow her down. The title subject, Iris Apfel, has become a bit of a style icon; she’s known for her carefree attitude and flamboyant attire. Maysles’ approach is relatively low-key; there isn’t any particular all-encompassing story to the film. It’s just a few days in the life of a real character. Still, the film is entertaining, upbeat and enjoyable; like spending a day with your lovably crazy grandmother. Over the course of the film’s eighty-minute running time, Iris has run-ins with apparent heavy-hitters in the fashion world, as well as none other than hip-hop icon Kanye West, who miraculously expresses genuine interest and gratitude towards the elderly woman. Mostly, though, Maysles just follows Iris through various clothing and fabric stores and documents her interactions with store owners and designers. On paper, it sounds quite dull, but the execution is surprisingly engaging. Iris’ husband, Carl, is equally as entertaining as his wife. The couple lives in a lavish home filled with toys, trinkets, and various obscurities. Their relationship is adorable and charming, and Maysles captures everything from their love for one another to their typical couple tiffs—the most amusing of which is an argument over whether or not they have run out of yogurt. By the end of the film, plenty of viewers will undoubtedly want the wacky couple—who have no children—to adopt them as their own. There’s something to be said about capturing someone’s true nature on camera. With documentaries, especially, it seems to be a daunting task to get the absolute truth out of a person, as it is human nature to play up to the camera. And while Iris and Carl certainly seem like a vivacious and animated couple, their personalities never feel disingenuous or phony. They truly are a wild, lively, and undeniably lovable duo, and Maysles’ ability to capture them in sincere fashion is nothing short of brilliant. Right up until his death, even in his late eighties, Maysles was still an unbelievable documentarian. Iris’ occasionally self-deprecating attitude and apparent disdain for traditional views of beauty and self-importance provide plenty of humorous anecdotes and, as a result, make the film immensely quotable. It is absolutely fascinating listening to Iris discuss how “pretty” is overrated, and her lack of traditional attractiveness is what caused her to develop such a strong personality, which in turn has made her an immaculate success. At its core, that’s really what Iris is all about. It’s about being happy with being who you are, and never apologizing to those who can’t appreciate your true character. Iris is a well-made, engaging, and lighthearted tale that lacks any sort of cynicism. The consistently upbeat and hopeful tone of the film is sure to have audiences leaving the theater will smiles on their faces. 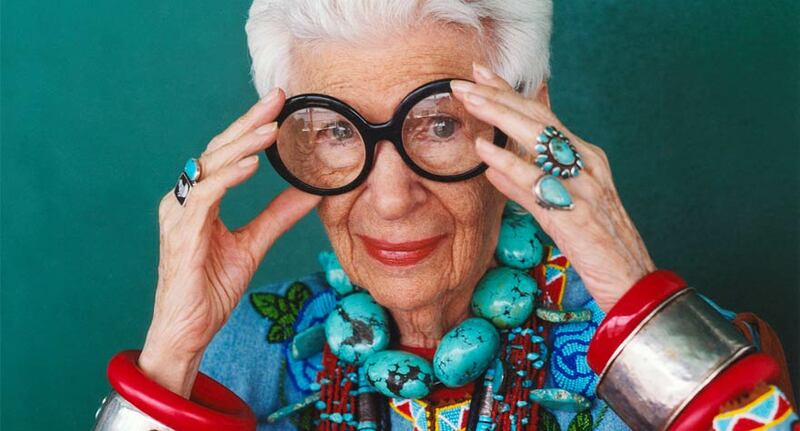 It’s always nice to see legendary directors go out with a bang instead of a fizzle, and Albert Maysles certainly does just that with Iris. Make sure you see this movie. Even if you couldn’t possibly care less about fashion, socialites, or style, make sure you see this movie.